Europe 1944: Captain Billy Boyle and his friend Lieutenant Piotr “Kaz” Kazimierz are sent to neutral Switzerland to work with the Office of Strategic Services (OSS), investigating Swiss banks that are laundering looted Nazi gold. The U.S. and Swiss governments are about to embark on diplomatic discussions regarding the Safehaven Protocols, aimed at limiting the amount of war materials exported by Switzerland to the Nazis, stemming the tide of looted gold, and preventing postwar use of Nazi wealth by war criminals. With the talks about to begin and the Gestapo ever present, the OSS wants Billy and Kaz to protect the participants, which turns out to be a very deadly task. The plans go wrong from the beginning when Billy and Kaz crash land in France. As they make their way through occupied territory to the border, they meet Anton Lasho, a member of the Sinti ethnic group, whose family was slaughtered by the Nazi killing machine. They’ll need his help, because as they find once they make it across the border, Swiss banks are openly laundering gold “harvested” from concentration camps, and those who are profiting will do everything they can to protect their wealth and hide their dark secrets. 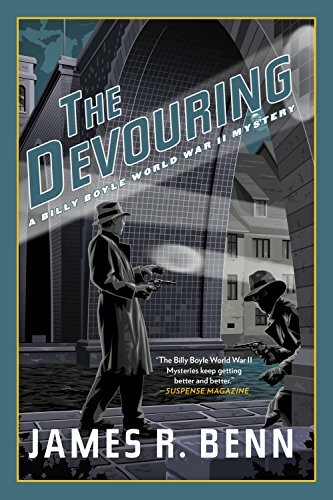 The Devouring by James R. Benn is the 12th installment in the wildly successful and critically acclaimed Billy Boyle World War II mystery series. Benn’s debut novel, Billy Boyle, was named one of the five top mysteries of 2006 by Book Sense and was a Dilys Award nominee. A white-knuckle adventure from the start, Billy Boyle, and his quick-witted companion, Kaz Kazimierz, have been ordered by the OSS to scrutinize Swiss banks that have been suspected of laundering looted Nazi gold from concentration camp internees and other entities. James Benn’s novels are widely known to be well researched, all of which lend historic believability to the numerous plot twists of his novels. The Devouring is no exception to this trend, as Benn reveals the scandalous reality behind Swiss banking greed and their collusion with the Nazis. The electrifyingly relentless twists of fate, numerous escapes from danger and everpresent risk of death or arrest of our heroes, provide an abundant amount of rollercoaster thrills that will captivate any reader. In The Devouring, Benn has created yet another thoroughly entertaining historical mystery page-turner that is filled with bountiful amounts of action and adventure. His ability to bring fresh understanding to an already well written about period of history is refreshing. A highly recommended read that will not disappoint.